It is very impressive to see the American Red Cross using web technology extensively to reach the world with the latest news and messages bulletins. The newsroom of the American Red Cross is constantly updating with the latest news, messages. They have put the technology to the right use by distributing the information at the same time and not waiting for the media to print it after a lapse of few hours or even a day. As of Sunday morning, more than 21,600 people had registered with a special Red Cross Web site to help people search for their loved ones. The Web site of the International Committee of the Red Cross (ICRC) enables people in Haiti and abroad to search for and register the names of relatives missing since the earthquake. The web address is: www.icrc.org/familylinks. 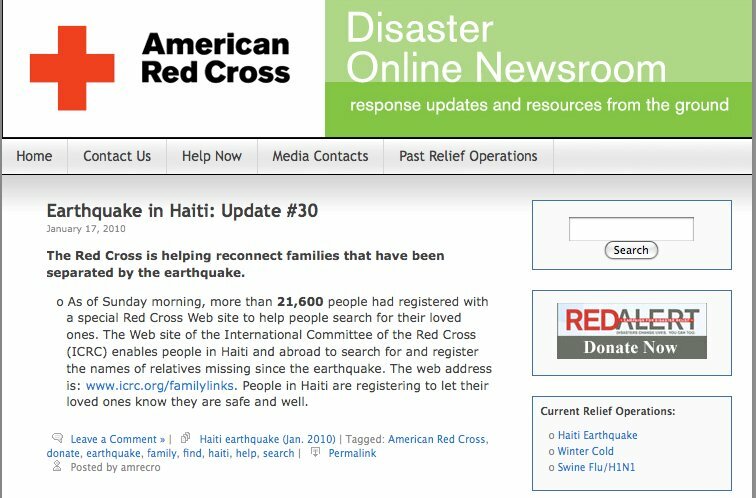 People in Haiti are registering to let their loved ones know they are safe and well. The damage is extensive, and we know that this is going to be a massive and costly long-term recovery operation. As of January 16, the American Red Cross has raised more than $87 million for relief efforts. We know that we are going to spend much more than that to help the people of Haiti. The Red Cross has already released $10 million for Haiti relief efforts, and will be adding more. Future allocations will be made once we know more about the situation on the ground in Haiti and the greatest needs for both the short and long term. Terrible times like these bring out the best in people, and we are grateful for the support being given to the American Red Cross. People can donate in support of the relief effort in Haiti at www.redcross.org or by calling 1-800-REDCROSS. Mobile donors can text “Haiti” to 90999 to make a $10 contribution.